NOTE: The US Lacrosse Youth Council has developed modified rules for ages 15 and under play. To get a copy of these rules contact US Lacrosse at 410.235.6882.
c. body checking an opponent from the rear or at or below the waist; d. body checking an opponent above the shoulders. A body check must be below the shoulders and above the waist, and both hands of the player applying the body check must remain in contact with his crosse. Body Check: Contact with an opponent from the front - between the shoulders and waist - when the opponent has the ball or is within five yards of a loose ball. 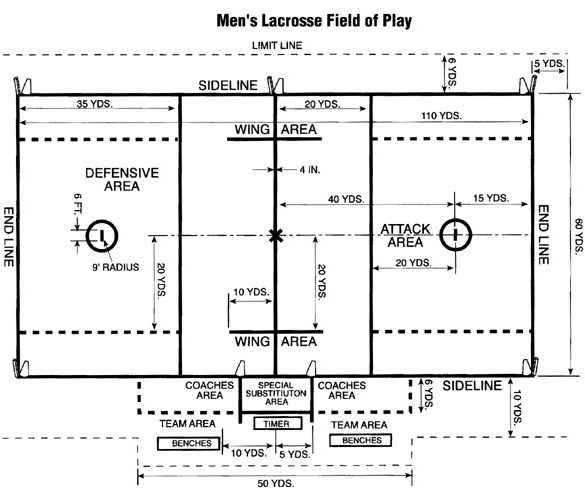 Box: An area used to hold players who have been served with penalties, and through which substitutions "on the fly" are permitted directly from the sideline onto the field. Unsettled Situation: Any situation in which the defense is not positioned correctly, usually due to a loose ball or broken clear.